So happy to be sharing this post with you all today! Earlier this week, I was invited to appear on The Marilyn Denis Show for a SUPER fun segment – DIY Thrift Store Showdown. Where myself and Amy from LoveOnSunday were asked to shop at our favourite Thrift Shop, Value Village to create a whole space for under $500 (including DIY supplies). I decided to create an Outdoor Garden Oasis with my thrifted item and the results were fantastic! Every single item in my vignette was 100% thrifted and I came in totally below budget! I’m so pleased to say that I WON the first ever DIY Thrift Store Challenge on the show and came in at less than $300! Read further to see the before pictures of the pieces that make up my Outdoor Garden Oasis and you can watch this super fun segment online! 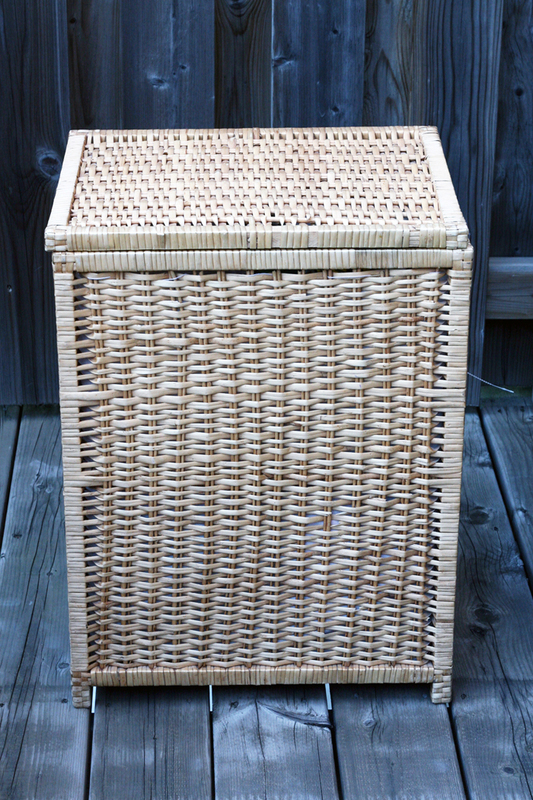 On my first trip to Value Village, I spotted a great wicker laundry basket that inspired me to create an outdoor garden oasis. 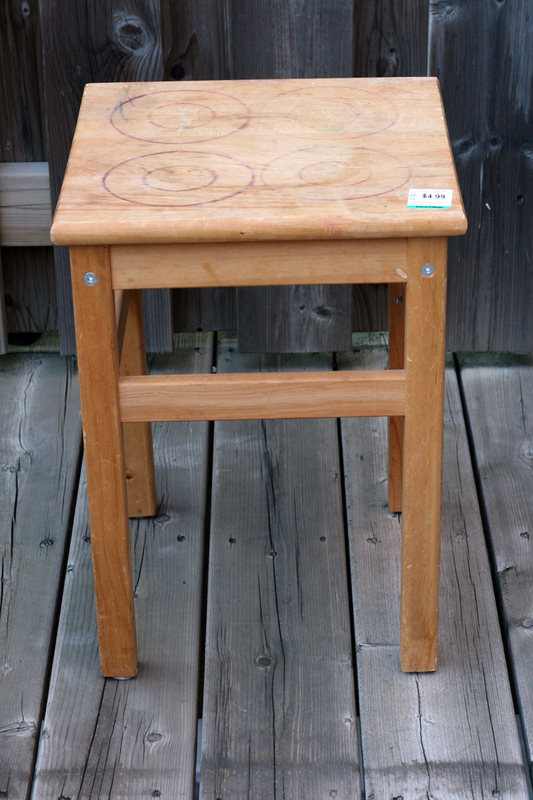 Since wicker can get expensive, I took the opportunity to transform the steal ($14.99) into a small outdoor table with built in storage simply by sawing off the small legs, spray painting it off-white and attaching spinning wheels. 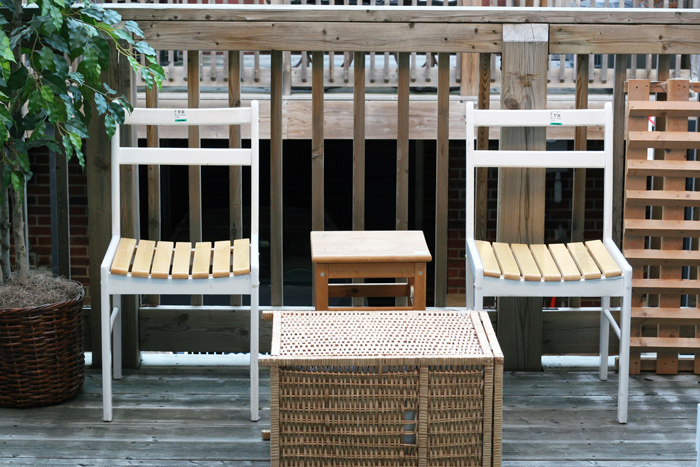 No patio set would be complete without a couple of chairs. I found a couple for a bargain ($4.99) and sanded them down, and then spray painted the pair for a complimentary look. Additionally, a small side table was painted over for a small space to rest drinks. The COOL FACTOR – a layer of chalkboard paint was applied for a fun and funky touch. Pieces like these can get a fresh update of paint each season to revive their look. Additionally, I created two chic ways to display flowers. The first was to take an old medicine cabinet and remove the door. Then I painted the interior and simple placed in small potted plants to display. A wine rack hung vertical served as the perfect place to rest either fresh or artificial flowers for a simple pop of colour. I scoured for plenty of accessories to complete the look. Value Village has TONS of inexpensive and gently used home decor items and accessories. 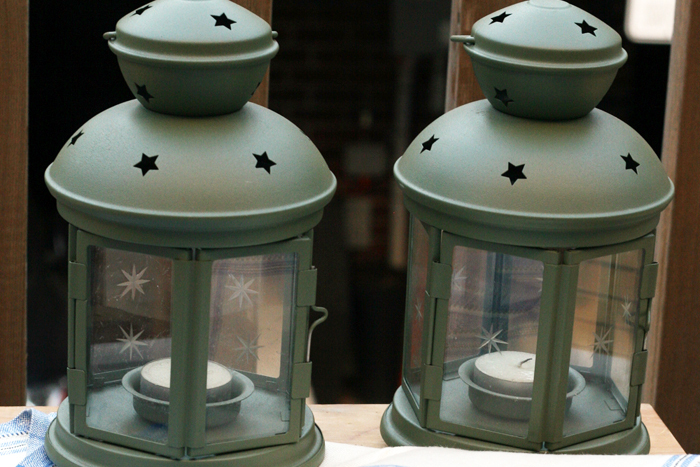 I found two tea light lanterns which I updated by giving it a bright blue coat of spray paint. 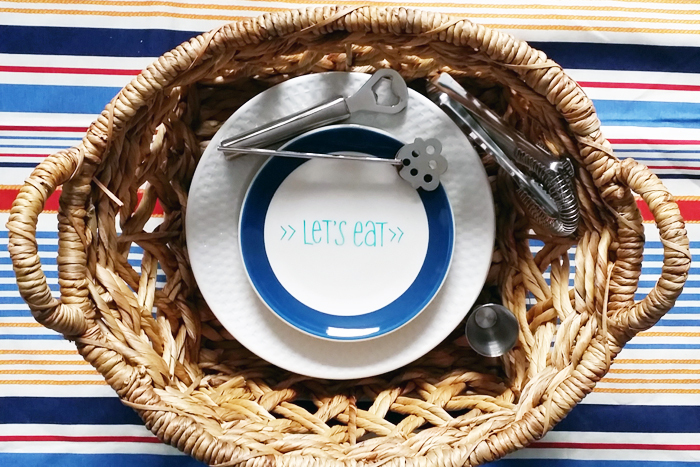 I also created a new spin to a traditional picnic basket by using a big basket and including bar cart accessories and personalized plates (I simply used ceramic/food safe markers). This is also a functional way to bring your dishes from indoors to outdoors. The striped seating cushion was also made from a piece of new fabric ($2.99) and cushion ($5.99) I found at Value Village. I used fabric glue instead of a sewing machine and it turned out great. This is a great alternative solution for those of you who are intimidated by the sewing machine! I want to say thank you to everyone who voted in the audience and online and also a special thanks to the team at The Marilyn Denis Show! What do you think about my first every TV appearance? I was so nervous the night before but so glad I am able to check this item off my bucket list! 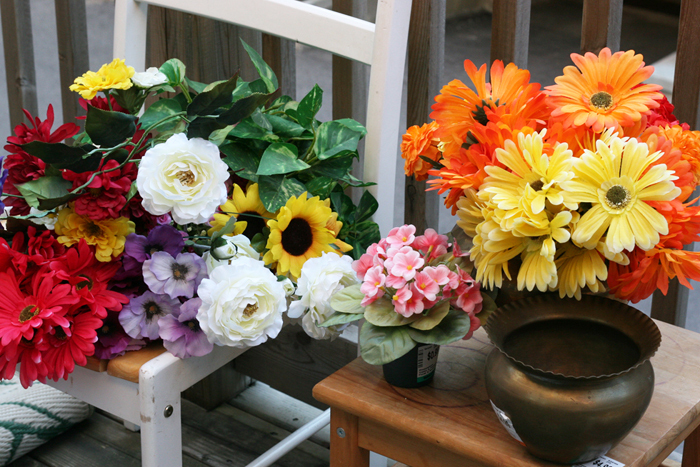 I hope this segment and my post will inspire you to tackle a few thrifted DIY projects. It really is extremely rewarding to transform used items into new treasures! If you have any questions about my Outdoor Garden Oasis, feel free to leave me a comment! CONGRATS on your TV appearance, that is so exciting! 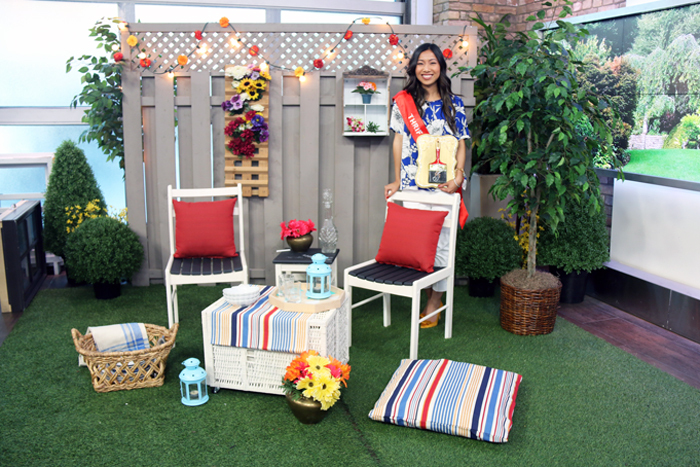 You did such a great job on your DIY segment, I love the after photos! I really love the wine rack idea with the pretty flowers! Definitely will have to give this a shot. Thank you so much Katja!!! I’m so glad you liked the segment and def give the outdoor floral arrangement a try!! You were fantastic on the show; great job! How’s the durability of the chalkboard paint? Do you find it stays on well? Congrats on your television appearance! I just watched the segment online – you were a natural! 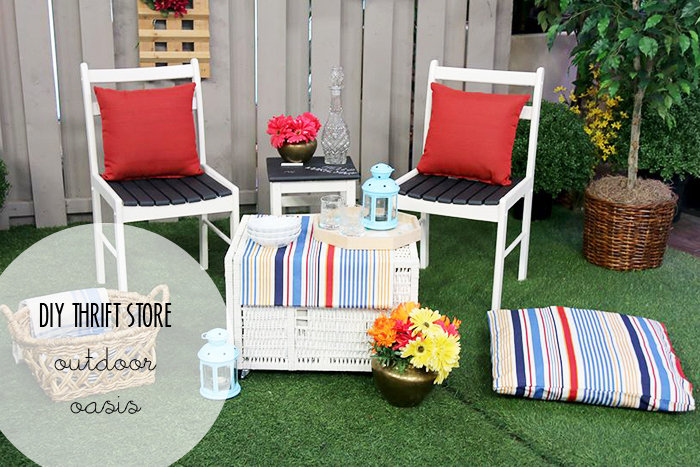 Congrats also on winning the first ever Thrift Store Showdown, your outdoor space was truly inspired. It’s amazing to see how you re-imagine pieces and put them to new use. Great job! Thanks Lesley!!! I truly appreciate your comment and that you enjoyed the segment! Hope you’re doing well and keep in touch! Congrats on winning! Great segment, I love what you put together!